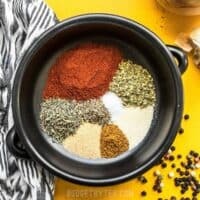 This homemade Cajun Seasoning is spicy, smoky, and will add TONS of flavor to your meat, vegetables, beans, pasta, and more. Combine all the ingredients and use immediately to season food, or store in an air-tight container, away from sunlight. *This seasoning is moderately spicy. You can control the heat by either adding more or less cayenne pepper.